To fit correctly the bottom row of tiles should be removed from the pitched roof and the existing felt should be bent back. The flat flashing should then be run underneath the felt and down onto the roof deck. Only attach the flashing to the deck. The pitched roof felt and bottom row of tiles should be replaced. Once complete the flashing should be covered with 75mm CSM Bandage. Re-inforcement mat should then be laid. 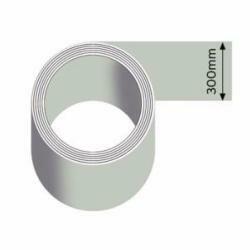 Also available in 600mm and 900mm widths.